DANIEL LANGHANS is originally from Cape Cod, Massachusetts, and currently lives in Tempe, Arizona. With a BFA from The School of The Museum of Fine Arts, Boston and Tufts University, Daniel is a full time Art Teacher and Artist. 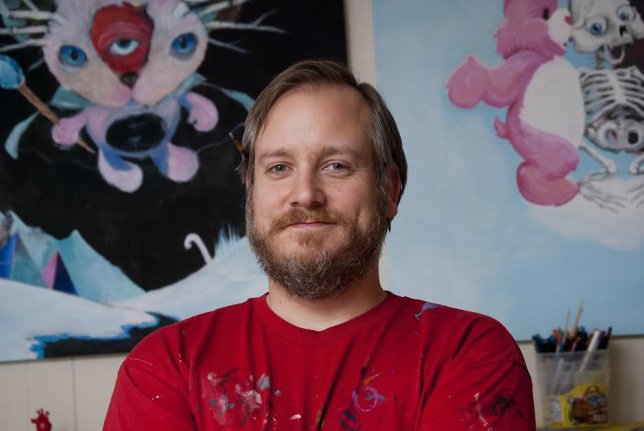 With the involved nature of his profession as a teacher Daniel is constantly working in a wide spectrum of mediums and concepts, but his favorites remain drawing and painting, most of which is focused on the deconstruction, symbolism and modification of pop culture characters and icons. Daniel's work has been taking up residence in galleries and private collections in the U.S., Germany, Italy, Scotland, Japan and Iraq.